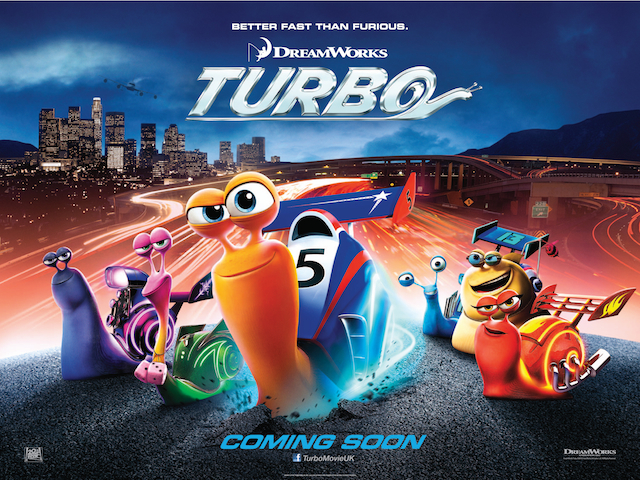 Another offering from Dreamworks, Turbo is the tale of a snail who dreams of being a racer, and despairs of his everyday humdrum life working in a tomato patch. After an extended opening where his boredom is explored a little too thoroughly, Turbo (Reynolds) finds himself transformed after an encounter with the fuel of a dragstrip racing car. Now he has the speed he needs to broaden his horizons and live his dream. With the unlikely help of taco seller Tito (Peña) and a motley crew of fellow snails led by Whiplash (Jackson), Turbo wins a place in the Indianapolis 500. Can he realise his dream? Can he win over his worried, over-protective brother Chet (Giamatti)? Can he defeat the world champion, Guy Gagné (Hader)? The answers are…very predictable. This is yet another plucky-underdog-overcomes-huge-obstacles-to-realise-his-dream movie, and while entertaining in a superficial way with some great sight gags and one running joke in particular that works well, Turbo never really takes off. The main problem lies in the plotting: there’s nothing here we haven’t seen a hundred times before, and while the cast is an amazing array of talent, the dialogue they’re given borders on the banal. The animation is proficient without having that extra zing that Pixar brings to the mix, or even Dreamworks themselves with movies such as How to Train Your Dragon, and the race itself feels, ironically, pedestrian. A missed opportunity, then, but still miles ahead of Planes and Cars 2. Rating: 6/10 – while the movie under performs as a whole, there’s still enough here to keep an audience occupied; will fare better with younger children, and if there’s a choice, see it in 3D which adds an extra crispness to the visuals.